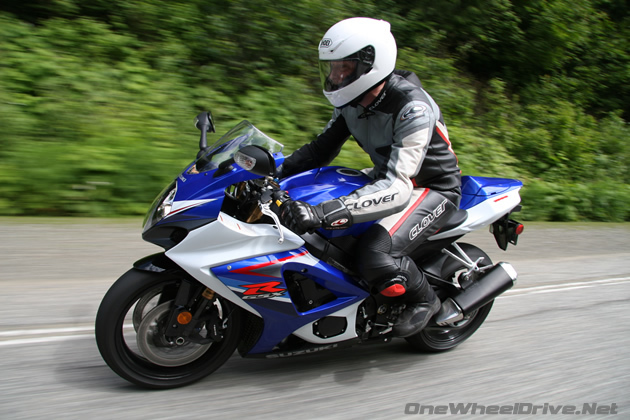 In third gear I roll on the throttle of Suzuki’s 2007 GSX-R 1000. Within seconds my riding companions are reduced to pinpoint headlights in the rearviews by fearsome acceleration. This is not so much an engine as four inline “hell-mouths” on whose demonic intakes you sacrifice gouts of virginal 94-octane gasoline conjuring a howling outflow of violence and velocity. On track, at 250kph and 14,500RPM the bike stutters against the rev limiter and the wind attempts to flay the leathers off my back. Fourth gear beckons, but there’s traffic ahead. I slow off to pass, mounted on a blue and white harbinger of common sense’s end. “Yep, but you were just gone.” Before heading out the K7’s, as the ’07 edition of the GSX-R 1000 is known in “Gixxer” circles, nuts and bolts numerology seemed a mixed bag – now I’m not so sure. The torque is down a hair from its predecessor to 11.9 kg-m (86.05 ft-lbs) from 12.0 kg-m (86.7 ft-lbs). That’s not a big deal except that punt is developed 1,000RPM higher than the 05-06 bikes’ 9000RPM indicating a drop in mid-range… Likely Bridgestone’s not loosing any sleep over BT015 profit margins as the K7’s rear tires shredded away under that rotational force. Muddying direct comparison Suzuki has brought the redline up 250RPM to a snarling 13,750RPM. Then there’s the weight; the 2007 has larded on 6kg (13.3lbs) bringing it up to 172kg claimed dry weight over last year’s svelte 166kg. That’s largely thanks to the new twin exhaust and associated plumbing to comply with Euro 3 regulations… Bench racers have no fear, your bragging rights are secure – Suzuki’s latest King of Zing is now putting out nearly 170hp compared to last year’s 150-plus figure. With that sort of power the GSX-R 1000 doesn’t disguise its extra mass so much as flat-out ignore it. True, plodding around you might miss the low-end grunt by comparison to the previous generation, a.k.a. the K6. And the throttle response in the low end definitely feels hard and jerky in the on-to-off transitions at low RPMs. A bit upsetting since anything short of the autobahn qualifies as a parking lot on this bike. Looking for roll on? The Gixxer deserves a lap timer for that alone. Count with me in second gear; one-one-thousand… two-one-thousand… three-one-thousand… four-one-thou – and we’re done, that’s enough for 100 to 200-plus kph roll on. Hitting the 14,500RPM limiter you’re trailing colorful expletives like warp drive special effects streaming the track behind you at 208kph (129mph). With that power on tap passing becomes a mix of blind arrogance and supreme confidence in the GSX-R’s acceleration. Planning overtakes? Pah, that’s for mortals. If the output seems a bit much, take solace in the S-DMS. Despite sounding like an anti-social disorder diagnosis, the Suzuki Drive Mode Selector actually controls the GSX-R’s power characteristics from a rocker-switch on the right-hand control cluster controls with three modes. Mode C hits the engine like a horse tranquilizer, relaxing the torque curve and collapsing the output to 118bhp. It’s good for poor conditions, crawling to the gas station on fumes, idling around town or for folks stepping up to the GSX-R 1000 badge with 600cc skills – read posers. B is like a captured tiger coming off sedation. Below 9000RPM you’re lulled by its docility, above that the high-end power game is back on with full ferocity occasionally stepping out the rear tire in the changeover. For low and mid speed corners though, Mode B lets you finesse power to the rear tire while still at lean… making for a quick ride. 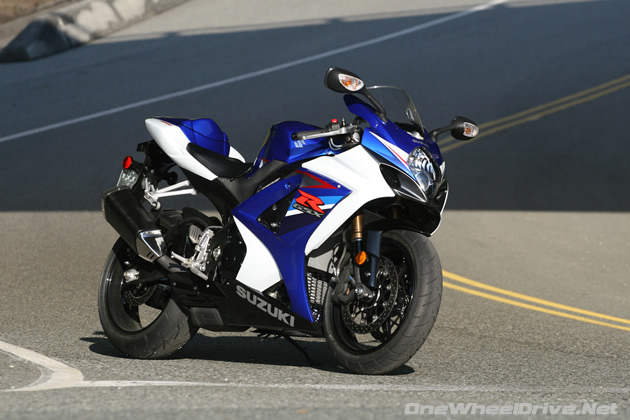 Mode A, the default, is pure undiluted GSX-R1000 – the full rear end slipping, front end lifting deal. The bonus here is you can switch modes on the fly, adjusting the map for the conditions. The corner is littered with gravel? Drop into B or even C. Clear running in a straight? 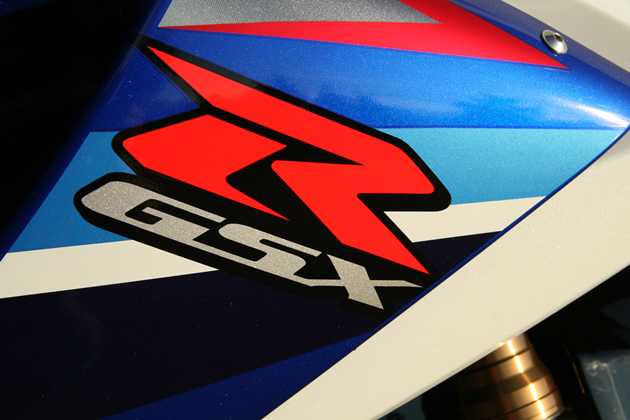 Nip up into A for the full GSX-R experience. Surprisingly, I opt for self-control and leave the bike in default A mode, finding the power delivery linear and predictable and throttle control subtle. Only switching to C mode for wet patches and gravel-strewn corners, while giving B mode a complete miss. What’s proving more important than this technological showpiece in the real world is the new Gixxer’s handling. How can something this fast feel so tranquil, composed and almost relaxed? The K7 trades some of the K6’s edgy and light flick-able “gixxerness” for civilizing stability, the result of slightly longer wheelbase, additional weight, and an electronically controlled steering damper that increases damping force with the speed. The 2007 feels more remote than its precursor and requires more relationship building, but the extra steering input required pays off with composure that sci-fi would call “slo-time”. Laid out before me along the rough surface of the Duffy Lake Rd., our local challenge to suspension, precision and judicious application of power, is an unexpected myriad of possible lines. 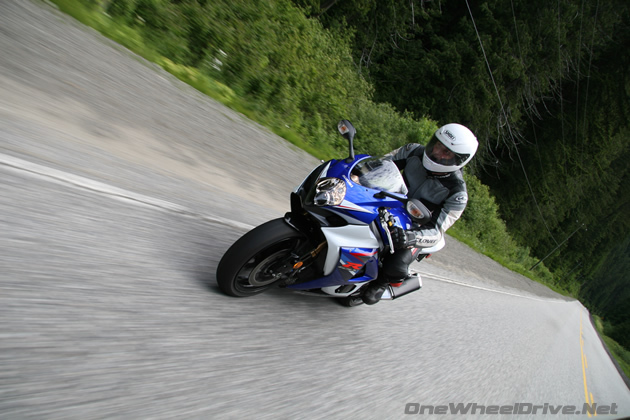 Brilliantly planted and precise, the GSX-R’s temporal space gives me time to strategize. Track between the rut and the pothole, apex early to avoid the gravel in the middle of the road, tighten the turn to correct for a wallow with a little hang off, then brake hard for a 90 degree turn onto a 20km/h marked single lane wood bridge… Best hit that upright and drop into “C” for good measure. 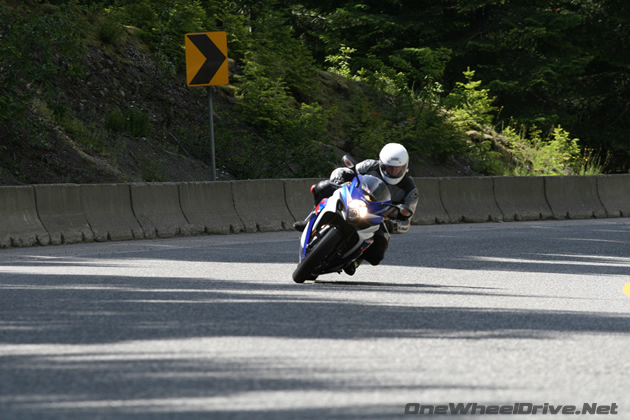 It’s a process the GSX-R makes feel like a leisurely act of fluid cornering sensuality. I keep thinking I should speed up, then I look at the speedo and realize the pace is already “clipping”. 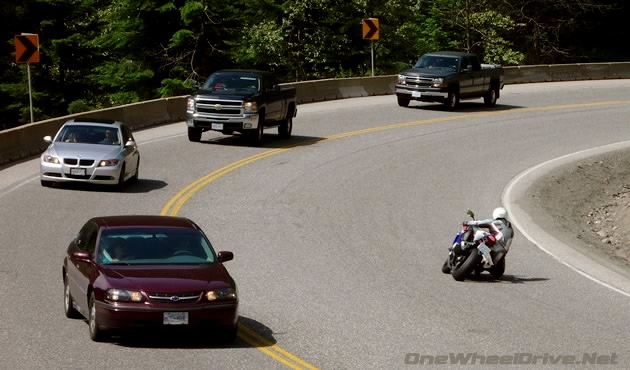 Suspension is integral to this confidence, the 2007 gains 5mm more travel front and back for a plusher road ride. The 43mm fork up front is adjustable for pre-load, high- and low-speed compression damping, and rebound. Out back the new shock gets two-way compression adjustability, a new shock linkage, along with pre-load, high and low speed compression damping and rebound adjustments. It’s a premium setup that shrugs off ruts and wallows in corners that are adrenaline pumping on lesser bikes. Hot into a decreasing radius 30kph that means business, speed’s only half the equation. Luckily the streets will be littered with all the dimes the GSX-R 1000 stops on. Suzuki hasn’t strayed from the radial-mounted four-piston calipers, and the stopping power and sensitivity at the lever is magnificent with a two-fingered pull. The 310mm discs are thinner to reduce rotating mass and are attached with 10 pins, instead of eight, allowing for better quicker heat dissipation and keeping braking performance more consistent over the course of hard riding. The feel of the slipper clutch has improved. You can still enthusiastically click downwards through the transmission’s slick gearing, but the action is smoother and more precise. The number of reaction springs has increased from three to four, and the cam settings have been revised, the sum of which also provides more natural engine braking. Now Suzuki, since you seem a bit less concerned about saving weight with the K7, perhaps a few extra grams of seat foam could be added? And while you’re at it rearviews have been around since Perseus killed Medusa, so you’ve had time to design something that gives riders a view something other than their elbows. Ah, at least they are relatively vibration free. Sitting at a coffee shop post ride, the GSX-R isn’t gathering a lot of glances. 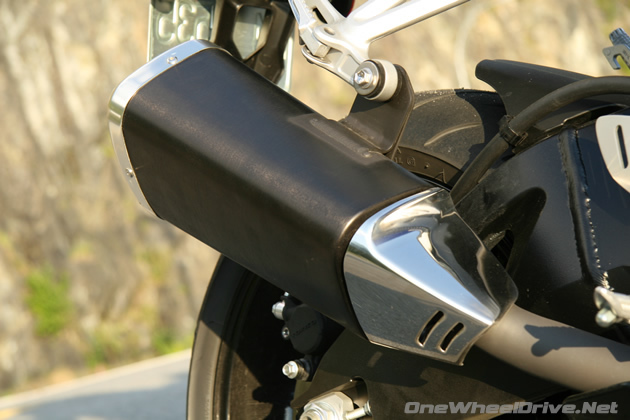 The triangle pipes look like a loutish 1970s attempt to envisage the future of sportbiking, by comparison last year’s single brushed-titanium finished exhaust is elegant. Overall the 2007 GSX-R looks a bit flash in metallic fleck in the blue and white scheme and decals that beg to be peeled away – given what this bike is capable of the wind may do that. At idle a distinctive low basso growl like a large caged predator issues from the twin pipes flagging this a GSX-R 1000, Suzuki’s WMD in the litre bike arms race. 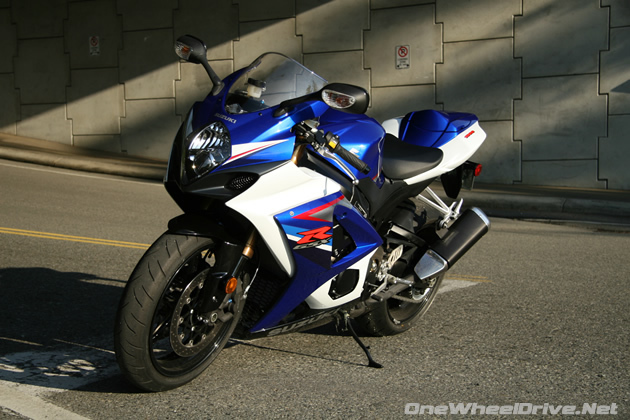 The 2007 GSX-R 1000’s feel of weight, steering, and stability has some gixx-a-philes questioning whether this is a true GSX-R.
Let’s see… It will leave your license in tatters, inspire you to try to outrun radio waves and depreciate so fast you’ll get a nosebleed. And it’s brilliant at going fast. Sounds like a GSX-R 1000 to me. It’s just that the K6 bike was extraordinary and the sequel reveals the diminishing returns of sportbike development. Ride the same roads on both bikes and the pace feels slower on the K7, despite the average speed being faster than the K6’s. The 2005-6 GSX-R 1000 may have given its riders more edge, but this new bike doesn’t make a sow’s ear out of a silk purse. Instead, far from the cloistered environment of the track, the 2007 Suzuki GSX-R 1000 shows that more weight, plusher suspension, and a softer throttle doesn’t always make for a worse road bike – it makes a fast one.